I spent some time with the problem and put together this response here. I know that various online outlets have discussed the answer as well; here are the respective solutions presented by The Guardian and The New York Times (don’t click those links until you think about the problem for yourself). But I think there’s a useful “information” framework to use in considering how to arrive at the answer. I discuss that framework at the end. Spoiler alert — I’m going to discuss the birthday answer starting in the next paragraph. 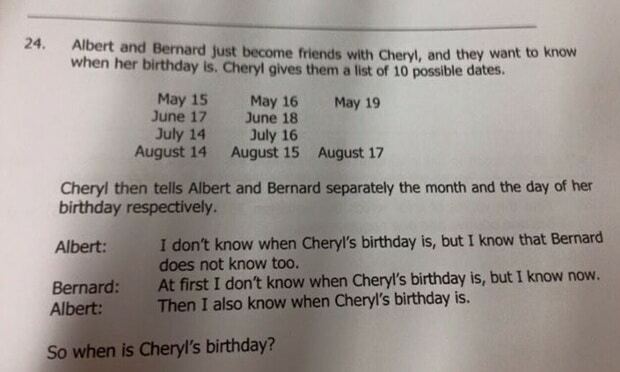 Line 1: Albert: I don’t know when Cheryl’s birthday is, but I know that Bernard doesn’t know too. This implies that the month is not May or June, as they are the only 2 months with unique date numbers (May 19 and June 18). Had Albert been told May or June, he could not say with certainty that Albert does not know the birthday. (Because had the month been May or June, Bernard might well have been told 18 or 19 — which would have conclusively informed him of the birthday. Since Albert knows Bernard doesn’t know, this means May and June are ruled out.) So if not May or June, we are left with July or August. This “informational takeaway” is a way of rephrasing things in terms of straight information, post-deduction. Line 2: Bernard: At first I don’t know when Cheryl’s birthday is, but now I know. Bit 1: “At first I don’t know…” — This doesn’t add any new information now. The only way Bernard could have known Cheryl’s birthday from only the date number would have been if he were told 18 or 19. That would have implied May 19 or June 18, respectively. But we know from Line 1 that the birthday is July or August, thus ruling out 18 or 19, thus ruling out Bernard knowing from the number alone. Thus this “informational takeaway” of Line 2, Bit 1: Bernard has been told 14, 15, 16, or 17. Bit 2: “…but now I know.” — So Bernard now knows Cheryl’s birthday (month & date). Had Bernard been told 14, there still would have been ambiguity on his part — July 14 and August 14 would have both been plausible. So he hasn’t been told 14. Thus the “informational takeaway” of Line 2, Bit 2: Bernard has been told 15, 16, or 17. Note Bit 2 is a narrowing of the information in Bit 1. From having been told 15, 16, or 17—Bernard can now deduce the birthday, as each of those numbers corresponds to one date (i.e. 15 implies August 15, 16 implies July 16, and 17 implies August 17). Line 3: Albert: Then I also know when Cheryl’s birthday is. The only way for Albert to know the birthday for sure is if he had been told July, for if he had been told August he would still have ambiguity about the exact date. But had he been told July, and knowing that Cheryl’s birthday is August 15, July 16, or August 17, Albert can deduce July 16. So Cheryl’s birthday is July 16. This is not simply a “stupid brain teaser.” This puzzle highlights “informational filters” as a powerful tool. In this case, uniqueness is used to filter out possibilities. Today I was at the grocery store, the hardware store, the library, and the post office. I drove to/from the grocery store and hardware store, but walked to the library and post office. We’re all confident in thinking, “therefore I didn’t leave my keys at the grocery store and hardware store.” Why? Because there’s a unique consequence to leaving car keys at a place—you can’t drive away! Assuming the keys are always in my pocket and they just fall out sometimes, it’s possible the keys are at the library, or the post office, or anywhere at my house or on the sidewalk or where have you. But they’re NOT at the hardware store or grocery store, or I wouldn’t have been able to drive away. Your friend asks you to pick her up from the airport. You know she arrives on a nonstop flight from Denver that gets in roughly at 9pm. It’s either Southwest, United, or American Airlines; you forget which. So you check. (All these times/flights are hypothetical, by the way.) The last American flight arrives at 7pm. Too early. So it’s not that. But there’s a United flight that arrives at 8:30 and a Southwest flight that arrives at 9:30. But wait! The United flight is not a direct flight. The only nonstop is the Southwest flight. So the flight is Southwest at 9:30. Try to come up more examples on your own. The birthday problem is a more formalized version of these probabilistic modes of “information filtering” that we do all the time. Whether we like it our not, our brains are constantly deducing conclusions from information we’re given. It’s just not that frequent that we’re asked to formalize logic so conclusively. If I had more time, I’d keep writing. But this is where I end. What does that tell you? Discuss.